The care you deserve. Wherever, whenever: Carilex VT•ONE, the portable NPWT product for all-around care. The care you derserve. Wherever, Whenever: Carilex VT•ONE, the portable NPWT product for all-around care. Here at Carilex, our motto is "caring makes the difference". The care for our patients has always been the primary drive for us to strive for excellence. We pride ourselves in creating products that take care of our patients whenever they are needed. To us, the real meaning of care lies within providing completely thorough and uninterrupted therapy at all times. 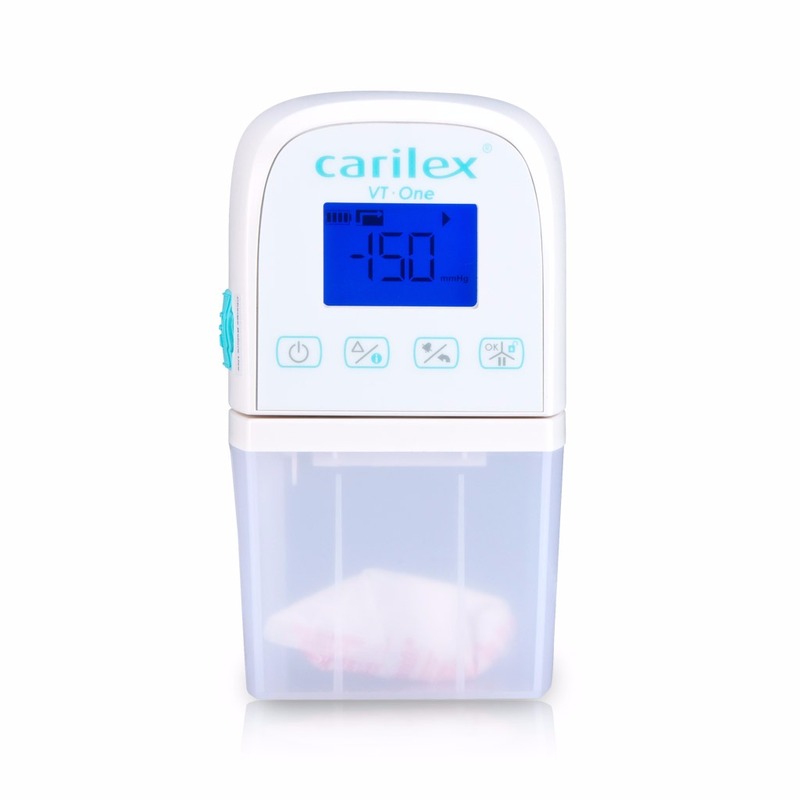 Introducing Carilex VT•ONE, a miniature portable negative pressure wound therapy unit designed to deliver extensive therapy for wound management. A genuinely thoughtful product healing, whisper quiet, and is incredibly lightweight, This means our patients can receive the care they need even on-the-go. NPWT is a proven solution to provide exceptional wound therapy for patients. As a part of a comprehensive negative pressure wound management, VT•ONE is simple to use, whisper quiet and incredibly powerful. It is compatible with every stages of care. No more various products for various stages of care, VT•ONE is the only one you will need. VT•ONE offers intermittent and continuous operation modes, individually adjustable pressure settings, and outstanding high fluid removal rate. The incredibly lightweight design is an ease to carry. VT•ONE provides all-around, uninterrupted wound care that fits right into our patient's active lives. With teams of research and design experts across three continents working tirelessly throughout the years, VT•ONE is an exceptional product that allows our patient to be healed while maintaining their active lifestyle, because here at Carilex we care about making your life easier. We care about making a difference, and most importantly, we care about giving you the care you derserve. * For complete indication for use please refer to the VT•ONE user's manual. Do not operate this produst before reading the manual thoroughly. The application of negative pressure helps maintain a moist environment for the wound bed, while removes fluids and excess exudates, infectious materials, tissue debris, and reduce tissue edema, thus may promote wound healing. It may be beneficial for patients with traumatic and dehisced wounds, partial thickness burns, chronic wounds such as pressure ulcers, diabetic foot ulcers and venous leg ulcers, acute wounds and flaps and grafts. With continuous and intermittent operation modes, individually adjustable pressure settings, and disposable collection canister, VT•ONE, provides all-around wound therapy that fits every stages of needs. Automatic power detection sensor activates bat- tery backup in the event of power failure and allows treatment to continue uninterrupted during patient transportation and examination. Designed for single patient use. Negative pressure is delivered constantly to the wound bed with customizable pressure setting to suit each patient's prescription. Intermittently transitioning the pressure setting applied to the wound bed to suit each patient's prescription, thus increase stimulation to the wound. Displaying the total accumulated usage time of the device. Long battery life up to 16 hrs, for uninterrupted therapy and portability. Including a convenient carrying bag to strap over the shoulder comfortably. VT Dressing Kit is indicated for patient who benefit from wound management therapy via the application of negative pressure wound therapy for removal of fluids and excess exudates, infectious material, and tissue debris which may promote wound healing. The VT Dressing Kit delivers superior performance by maintaining prescribed negative pressure at the treatment area. VT Dressing Kit is carefully engineered to promote the most effective healing result while stringently tested for optimal comfort and safety our patients needed. Providing efficient exudate flow rate and evenly deliver the negative pressure to wound bed. Uncomplicated drape design allowing effortless application. Its Moisture Vapor Transmission Rate compliment the foam and other dressing components for efficiency effect. Allowing patient to use safely and comfortably. Allowing quick and clear inspection for blockage. Preventing leakage from the tubes. The VT•ONE Canister is an er gonomically designed, Translucent, lightweight fluid and exudate collector. The sophisticated three layer filter system work as a barrier to avoid cr oss contamination and odor . With reservoir container gel sachet to solidify collected fluid, VT•ONE Canister allows safe and hygienic disposal after use. Easy-to-read fluid level markers wer e designed so operating it will always be a breeze. Ensuring safe and hygienic fluid collection and disposal. Sophisticated barrier designed to avoid cross contamination and odor. With over thirty years of experience, Carilex has established itself as a global leader in the wound care industry by developing leading-edge technology in the prevention and treatment of wounds. Together with commitment and constant innovation, Carilex is driven forward by our motto - CARING MAKES THE DIFFERENCE.